We are also into the business of providing industry standard PVC Tarpaulins. The base fabric of this product is made out of High Tenacity Ployester Yarn and the PVC layer is then Coated or Laminated from both sides making it the best PVC Tarpaulin. PVC Tarpaulins also come in a Flame / Fire Retardent Varient. 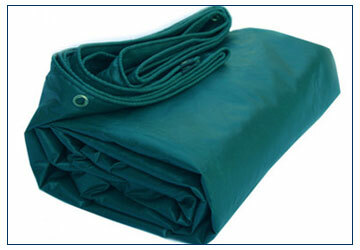 These Flame / Fire Retardent Tarpaulins are coated with a special chemical which make them useful for specific use where there is high risk of fire. • Super Strong Eyelets and Grommets. 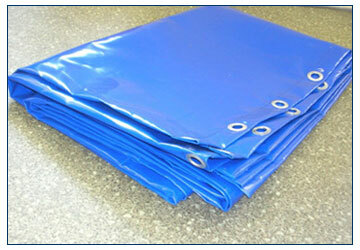 • High quality use of PVC ensures extremely long life of PVC Tarpaulin. • Excellent Tensile Strength, flexible, suitable to sustain torrent climatic conditions and has high tear strength. • Strong heat-sealed joints. UV Resistant material. 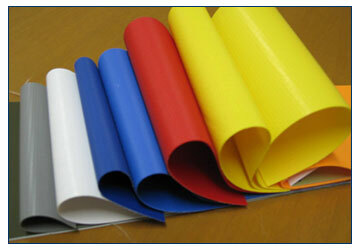 • Colours of PVC tarpaulins can be customised as per customer requirements. • PVC Material is widely used as awnings, truck tarpaulins, tents and banners. • PVC is also used as an adumbral material for building facilities and houses. • It is used extensively in international sporting arenas such as golf parks and baseball stadiums and also used as pitch covers in Tennis and Cricket grounds. and filament yard which is normally undyed. various thickness (GSM) to make the sheet strong and sterdy. PVC Tarpaulins can be supplied in customized sizes, thicknesses and colors.